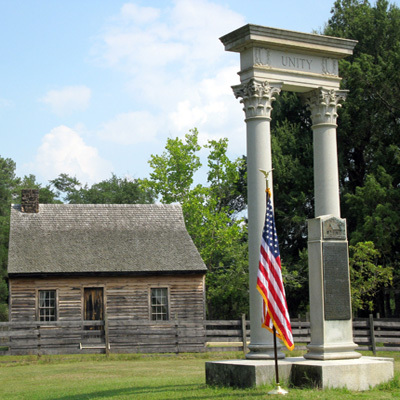 Source: Unity Monument at Bennett Place Historical Site. Courtesy of Bennett Place State Historic Site. The monument consists of two tall white Corinthian columns, one representing The Confederacy and one representing The Union. The columns are joined at the top by a lintel with the text “UNITY” flanked by two shields. A stone tablet in front of the columns holds bronze plaques on both sides. The general design of the memorial had been suggested in 1922 by Frank C. Brown of Trinity College (now Duke University) who envisioned “columns of the type made familiar by their use on the porticoes of the old southern mansions.” These columns standing alone would “fittingly typify the old south.” Although the memorial’s inscription is dated October 12, 1923 the dedication ceremony was held on November 8, 1923. Bennett Place was named a state historical site in 1923 after a push by the State Legislature (particularly Rueben O. Everett and Frank Fuller) and the donation of the site and the memorial by the Morgan Family (Samuel Morgan had owned the land, but died in 1921). Those involved wished to build a “monument to national unity at the site”. Front: ONE HUNDRED FEET EAST OF THIS SPOT IN THE BENNETT HOUSE GENERAL JOSEPH E. JOHNSTON AND MAJOR GENERAL WILLIAM T. SHERMAN MET AT NOON, APRIL 17, 1865, TO DISCUSS TERMS OF A PROPOSED SURRENDER. THEY MET IN THE HOUSE AGAIN ON APRIL 18 AND WROTE AND SIGNED A "BASIS OF AGREEMENT," UNDER THE TERMS OF WHICH GENERAL JOHNSTON AGREED TO SURRENDER ALL THE CONFEDERATE ARMIES THEN IN THE FIELD. PRESIDENT ANDREW JOHNSON REJECTED THE TERMS AGREED UPON, SENT ORDERS TO GENERAL SHERMAN ON APRIL 24 "TO GIVE FORTY-EIGHT HOURS' NOTICE AND RESUME HOSTILITIES AT THE END OF THAT TIME," AND ORDERED GENERAL GRANT TO "DIRECT MILITARY MOVEMENTS". GENERAL GRANT ARRIVED IN RALEIGH ON APRIL 24, BUT OUT OF CONSIDERATION FOR GENERAL SHERMAN HE DID NOT ASSUME COMMAND. ON THE EVENING OF APRIL 25, GENERAL JOHNSTON "ASKED ANOTHER INTERVIEW" WITH GENERAL SHERMAN "TO RENEW NEGOTIATIONS," AND ON THE TWENTY-SIXTH AT 2 P.M. THE GENERALS MET A THIRD TIME IN THE BENNETT HOUSE AND SIGNED THE TERMS OF "A MILITARY CONVENTION." UNDER WHICH 36,817 CONFEDERATE SOLDIERS IN NORTH CAROLINA AND 52,453 IN GEORGIA AND FLORIDA LAID DOWN THEIR ARMS. THIS MONUMENT THUS MARKS THE SPOT WHERE THE MILITARY FORCE OF THE UNITED STATES OF AMERICA FINALLY TRIUMPHED AND ESTABLISHED AS INVIOLATE THE PRINCIPLE OF AN INDISSOLUBLE UNION. IT MARKS ALSO THE SPOT OF THE LAST STAND OF THE CONFEDERACY IN MAINTAINING ITS IDEAL OF INDESTRUCTIBLE STATES - AN IDEAL WHICH PRESERVED TO THE AMERICAN UNION BY VIRTUE OF THE HEROIC FIGHT GROWS IN STRENGTH FROM YEAR TO YEAR. Rear: IN FULFILLMENT OF THE WISHES OF SAMUEL TATE MORGAN AND IN HIS MEMORY, THIS MONUMENT AND GROUNDS ARE GIVEN TO THE STATE OF NORTH CAROLINA BY HIS FAMILY. / SAMUEL TATE MORGAN, JR.
Samuel Tate Family and State of North Carolina. The State Legislature formed the Bennett Place Memorial Commission with the intent of building a monument to national unity at the site. Julian S. Carr dressed in a Confederate uniform was the first, and lengthy, speaker. Governor Cameron Morrison accepted the memorial on behalf of North Carolina and gave brief remarks. Senator Burton Kendall Wheeler of Montana, representing the north gave the keynote speech. D.H. Hill of Raleigh gave the speech for the south. W.H. Fitch, a grandson of General William Tecumseh Sherman spoke and Major General A.J. Bowley, Commander of Ft. Bragg was also on the program. Mrs. W.R. Reynolds of Charlotte, daughter of S.T. Morgan who donated the property, unveiled the memorial. The general theme of all who spoke was gratitude that the Union had been persevered. Senator Wheeler used his pulpit to also address some of the political issues facing the nation. Speaking on the “battles of civic righteousness” that were before the nation he stated North Carolina should be one of the fertile grounds to fight those battles as less than 1% of North Carolinians were foreign born. He saw one of the states’ strengths being this “unusual preservation of parent-American stock.” Wheeler also spoke on the need for stronger child labor laws calling for the slavery of little children to end as the South’s surrender at Bennet Place had ended chattel slavery. He then criticized the Supreme Court for recently having ruled a North Carolina Child Labor law unconstitutional. Continuing with the slavery analogy he said the power of large financial institutions had created a form of economic slavery for the average American, especially the rural farmer. Bennett Place was the site of the largest troop surrender of the Civil War. Confederate General Joseph E. Johnston and Union General William T. Sherman met on three occasions at the farmhouse of William Bennett, halfway between Sherman's headquarters in Raleigh and Johnston's in Hillsborough. They ultimately worked out terms to surrender over 89,000 Confederate troops in the field in the Carolinas, Georgia and Florida. The Bennett Place farmhouse that burned down October 12, 1921, was reconstructed in the 1960’s. Charles Pattishall, a Durham businessman with an interest in Civil War history, was appointed to a committee headed by Dr. Lenox Baker to plan a Bennett house reconstruction. He noted that the former William Haynes Proctor house at 1917 Chapel Hill Road, which was in the process of being torn down, was similar to the original Bennett farmhouse. It has a Victorian exterior of log structures of similar size and vintage as the Bennett structures. The main structure was found to fit the old house foundation very closely. It appears that one wing of the house was separated and transformed into the kitchen structure. The reconstructed smokehouse may have come from this structure as well. The Julian S. Carr Chapter United Daughters of the Confederacy declined to participate in the dedication. Although they approved of marking the spot for historical purposes they were “out of harmony with the plans of the State Historical Commission to make of the unveiling a gala celebration… and glorify the spot” where the last large surrender of the war occurred. After much debate at an October 5, 1923 session of the Daughters of the Confederacy state convention in Greensboro, the body voted to support the Carr Chapter in their boycott. The Durham ladies felt the monument as constructed constituted a “monument of defeat.” At a mass meeting held in Durham on October 22 that included Confederate veterans the memorial plans were strongly endorsed. Editorials and news articles across the state also seemed to support the memorial. The controversy caused United States Secretary of War, John W. Weeks to withdraw as the dedication’s keynote speaker upon advice of the President. The Daughters had also expressed opposition to Weeks’ role because he was a northerner. The memorial columns are located at the Bennett Place State Historic Site, at 4409 Bennett Memorial Rd, Durham, NC 27705. The monument sits in front of the reconstructed Bennett Place farmhouse. In the 1970s, Bennett Place became a State Historic Site. A modern visitor center was built on the site; it is free and open to the public. The site is periodically used to for various civil war re-enactments.